Members may have heard rumours that the Society’s reciprocal arrangement with StrateGems, whereby UK members can pay the BCPS Treasurer for StrateGems subscriptions (and vice-versa for US subscribers to The Problemist), was to be terminated. That was indeed intended at one point, but after representations from various quarters, it has been decided to keep the arrangement in place. BCPS members who wish to renew StrateGems subscriptions for 2016 can therefore do so, by paying £30 (£39 for Fellows) to the Hon Treasurer, Steve Giddins. The BCPS is sad to announce the death of Adam Sobey, who died on 13th July. A composer of studies and fairy problems, Adam was our studies editor from 1968 to 2000 and our President from 2003 to 2005. We offer our condolences to his family and friends. A more substantial notice will appear in The Problemist. John Beasley, who had known Adam Sobey for many years, has written an appreciative and informative obituary, which he has posted at The John and Sue Beasley WebSite . When you get to the site click on ‘Orthodox Chess’ and then ‘Endgame Studies’ to access the obituary. Peter Fayers has put together a collection of Fairy Chess Proof Games, which he has made available to all on-line. You can see it at the John and Sue Beasley website. 2015/04/23 – John Rice – Grandmaster! The BCPS heartily congratulates John Rice, one of its leading members, who will be awarded the title of Grandmaster of Composition at the WFCC congress in Poland later this year. John was also elected as President of the Society at the recent Annual General Meeting in Nottingham; he is the first past president to be elected for a second term of office. John is known mostly as a master of the directmate twomover and is celebrated as the first composer to achieve a cyclic Zagoruiko. He now composes in most genres, including Fairies. He is an author of books on chess problems and was for 14 years the General Editor of The Problemist. 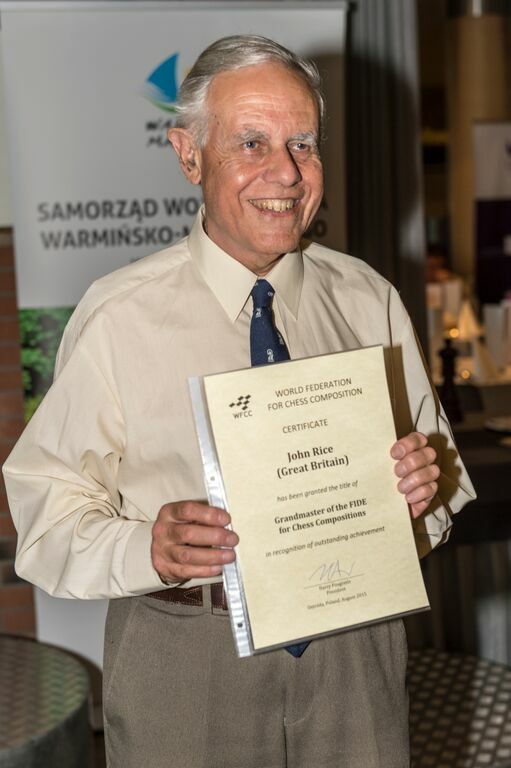 He would surely have earned the GM title long ago, had he not had breaks in contributions to the FIDE Albums, most notably when he was elected for the tough job of President of the FIDE Commission for Chess Composition, now the World Federation for Chess Composition (WFCC). 2015/04/23 – Yochanan Afek – Grandmaster! 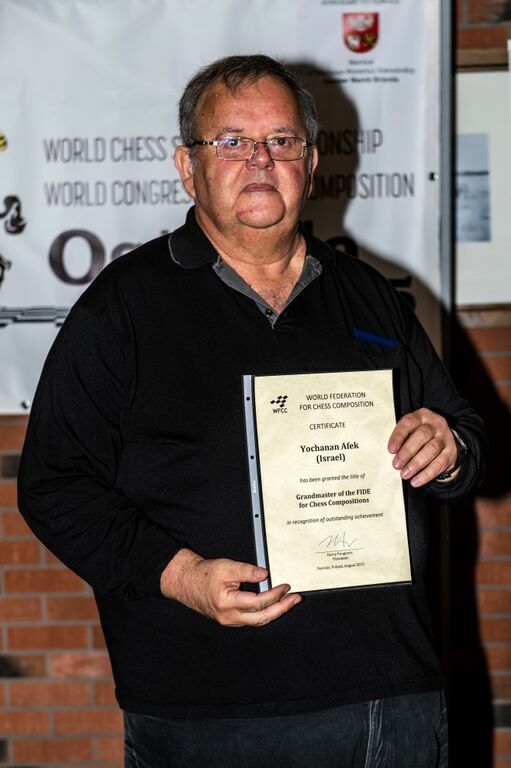 Yochanan Afek has qualified as a Grandmaster of Composition! We heartily congratulate our valued Problemist contributor and wish him many more years of composition, especially his brand of exquisite endgame studies. A tribute to the illustrious composer will appear in a future issue of The Problemist. We regret to advise that the Society's book sales service is currently suspended, following staff changes at Chess & Bridge, who have been working with us on this matter. Further information will be posted here when available.